Like a lady revealing her petticoats . . . | A balanced diet . . . 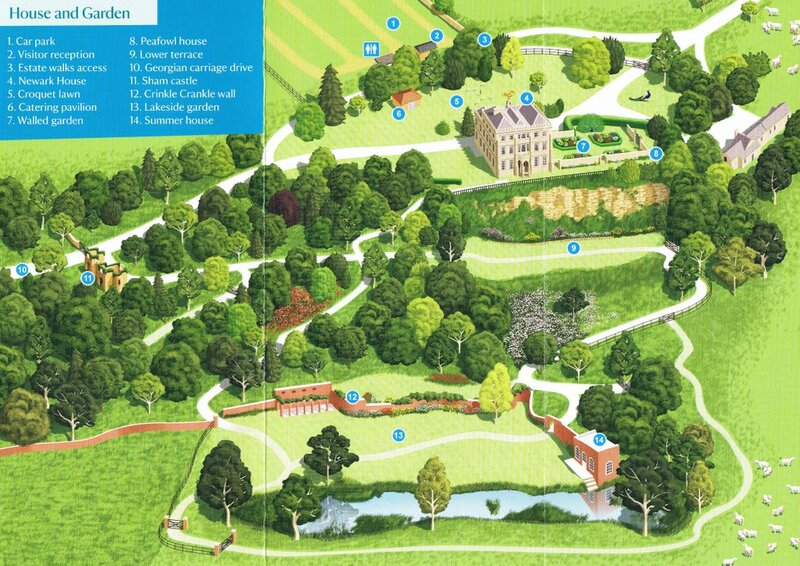 Standing proudly since the mid-16th century on the edge of the Cotswolds escarpment (map), with a magnificent vista southeast and west as far as the Marlborough Downs in Wiltshire and the Mendips in north Somerset, Newark Park began life as a Tudor hunting lodge. In the intervening centuries it has undergone many transformations, but it was not until the last years of the 20th century that this building began to yield up some of its hidden secrets. It has been in the hands of the National Trust since 1949. The south face of Newark Park, from the lower terrace [9 on the map below]. The view from the south terrace, towards the Mendips and the Marlborough Downs. Built by Sir John Poyntz, Newark Park (originally the ‘New Worke’) has changed ownership several times over the centuries, and each generation has left its mark. It was constructed over four floors: ground, first and second, and a basement. 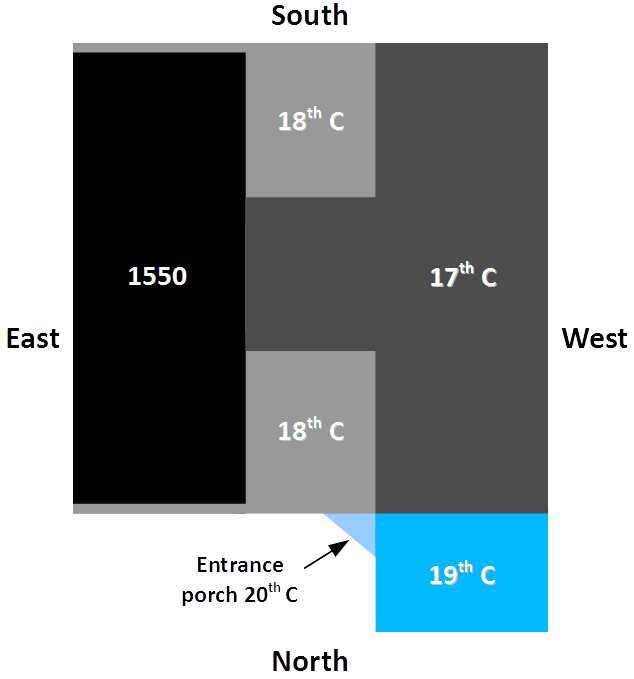 The original Tudor building was aligned north-south, with the main entrance on the east face. Newark Park as it might have looked in 1550. Note that there are no windows on the south wall (nearest). All the windows are on the east face. 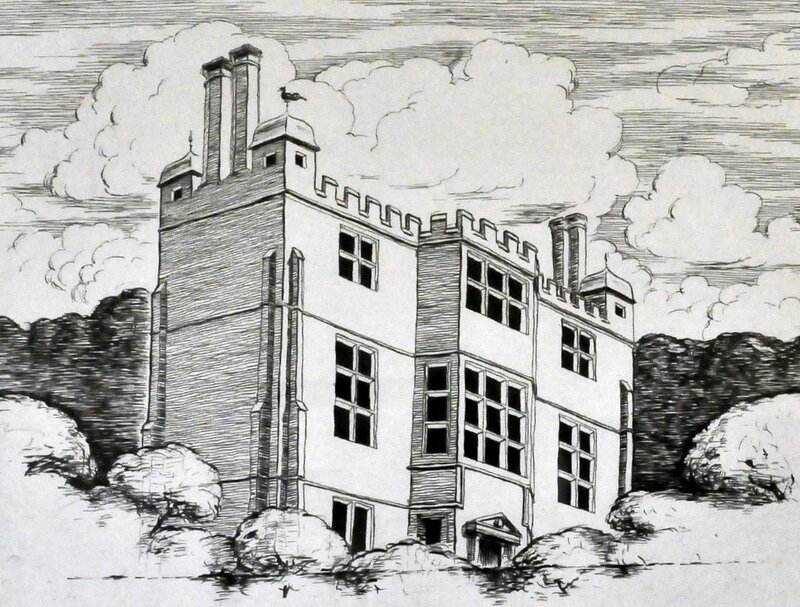 In the seventeenth century another wing was added, parallel to the Tudor one, and connected centrally, so that the overall shape of the building was like the letter ‘H’. This is what I remembered from the explanation using a model by one of the volunteers. I wish I’d taken photos of that model, which could be taken apart to show how the various building projects came together in the building we see today. Here’s my plan (not to scale). Further changes were made in the 18th century, and the building was squared to the shape we see today. But in doing so, and to retain the symmetry there are several false windows on the west face, or windows placed over internal chimneys on the south side of the Tudor wing. Other windows, on what would have been the west face of the original Tudor wing, were bricked in during the 18th century and became internal walls. A side wing was added in the late 19th century, and an entrance porch added after 1971. 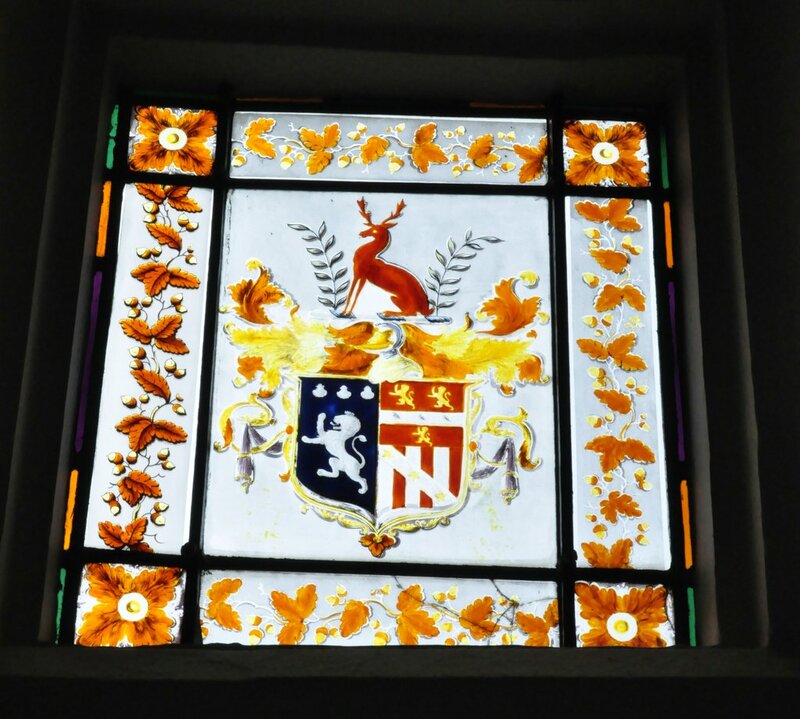 Coat of Arms of the Clutterbuck family, part of a large stained glass window on the first floor over the main door leading to the walled garden on the east side of Newark Park. 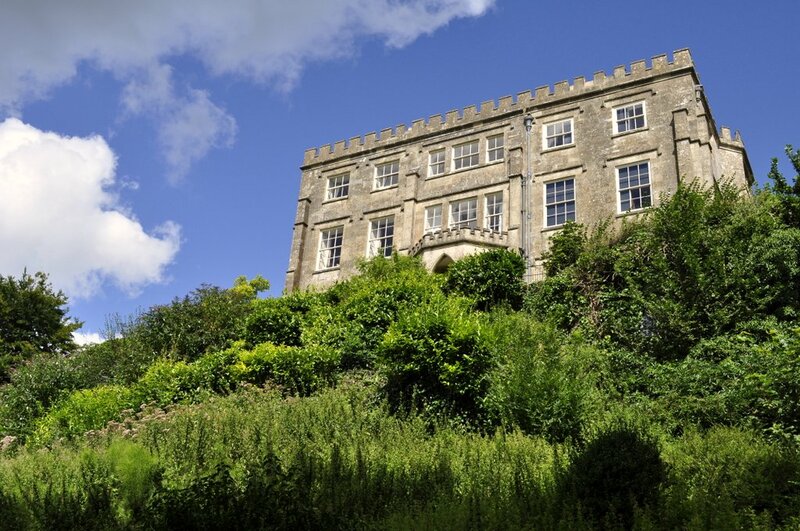 In the 1700s, Newark Park became the property of the Clutterbuck family and remained so until given to the National Trust, although they had not lived there since the late 1800s. A number of tenants took over Newark Park, but by 1970 it was in a considerable state of disrepair, the gardens were overgrown, and no-one remembered the buildings illustrious Tudor past. In fact, at one stage, the National Trust had contemplated letting the building become completely derelict. But the savior of Newark Park came along in 1971, and under the terms of a ‘repairing lease’ began to discover much of Newark’s past, uncovering many of its Tudor features that visitors can now see for themselves. Access to the Tudor basement is permitted only with a tour guide, but it’s worth it. The rest of the house is open almost everywhere. And what a delight it is. Not only is there eclectic collection of ornaments, paintings, furniture, glassware and the like, but the renovations made after 1971 opened much of the top floor. So who was this ‘Newark savior’? American architect Robert ‘Bob’ Parsons was born in Texas in 1920, and served as a soldier in the Second World War getting to know the Cotswolds at that time. After the war he settled in London, and apparently was looking for a ‘country house project’ to take on. He resided at Newark Park with his partner Michael Claydon until his death in 2000. 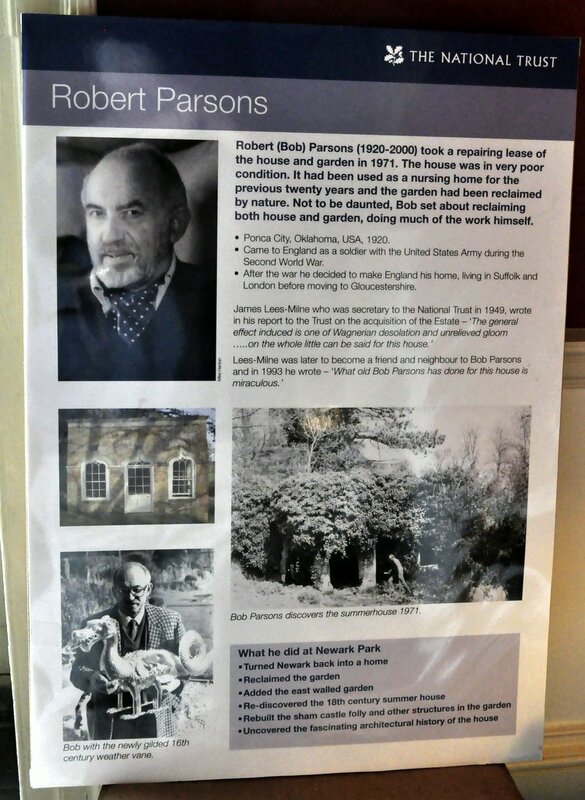 And it was due to all the repair work that Parsons undertook—far in excess of the lease commitment he had agreed with the National Trust—that Newark Park is what we see today. And that’s also why it now has Grade 1 listed building status. The gardens were completely overgrown, and when Parsons cleared those he uncovered several interesting features like the summer house  and a folly (11] in the process. Today the walled garden  on the east side of the hall looks like it has been there forever. But it was one of Parsons’ additions, and is completely in tune with the rest of the property. The whole estate extends to some 750 acres. Just click on any of the galleries below to view larger images. The east face of Newark Park house . Looking west long the south terrace. The entrance on the south face. The south entrance, looking eastwards along the terrace. The bow window of the east face that has the wonderful stained glass and coat of arms of the Clutterbuck family. The steps leading to the entrance on the east face. The south wall of the walled garden . Looking through the main entrance on the east face. The walled garden, looking east from the house . The walled garden  looking east from the first floor. Steph standing in front of the peafowl house . Detail from inside the peafowl house . So many features of the gardens were uncovered by Bob Parsons. Strange that their existence had been completely forgotten. Reflections of a summer house . The lakeside garden  looking north across the lake. The Crinkle Crankle wall  looking east towards the summer house . Inside the summer house . View west from the summer house  across the lakeside garden . Remains of a building on the north side of the lakeside garden , now covered in vines. The oldest Tudor part of the house, from 1550, can be seen in the basement, accessed by 18th century stairs in the company of one of the NT volunteers. Health & Safety regulations don’t permit free access downstairs! The 18th century stairs down to the Tudor basement. One of the most complete Tudor kitchens and fireplaces in any property in England. A tunnel that opens on the side of the quarry above the lower terrace . An old bread oven that was used to bake bread for troops stationed nearby during the Second World War. On the ground floor, there is a plain but elegant entrance hall through curved, wooden double doors. There is a wonderful view south over the terrace through yet another door. There are two rooms in the west (17th century wing): a dining room, and a sitting room with the most wonderful collection of Staffordshire pottery figurines, perhaps too many in the glass-fronted cabinet to do them justice. Wonderful nevertheless! The vestibule, with an 18th century portrait of an unknown lawyer on the wall, and the curved wooden door behind. Swan figurine in the vestibule. The chandelier above the swan figurine. The view from the south door from the vestibule. Late 19th century William Morris wallpaper on the ceiling of the dining room. Not sure what this is supposed to represent on the east wall of the dining room. The collection of Staffordshire figurines in the sitting room. An embroidered fire screen in the sitting room. Up the stairs to the first floor, you get a wonderful view of a 17th century glass window (the bow window on the east face), and a green bedroom off to the left. It apparently still displays the bed that was brought in during filming of the BBC1 2008 adaptation of Thomas Hardy’s Tess of the D’Urbervilles; two other scenes were filmed in the Tudor cellars. The main staircase, with the stained glass window behind. The stained glass window in the bow window on the east face of Newark Park. Detail from the canopy of the bed in the green bedroom. An embroidered mat made by Bob Parsons. This used to be an external window on the west side of the original Tudor (east) wing of Newark Park. Then up another floor, you emerge on to the most wonderful long gallery, with bedrooms, a study and other rooms leading off on both sides. The south end of the gallery has a large window offering, once again, incredible views over the Cotswolds escarpment and south. On one side there’s a cabinet with a collection of Bristol blue glass (and ruby and turquoise; envy once again!). In one of the bedrooms at least Parsons uncovered a Tudor fireplace during his renovations. The rooms certainly had that ‘lived-in’ feel about them. At the north end of the gallery a rope hangs down from the small bell tower on the roof, which is itself surmounted by a 16th century dragon weather vane in the form of a golden dragon. A water faucet at the top of the stairs just before entering the long gallery. Entrance to one of the bedrooms at the top of the stairs on the north side of the central 18th century addition to Newark Park. This Tudor fireplace was exposed during Bob Parsons’ renovation of Newark Park. The long gallery on the second floor, with the Bristol blue cabinet on the left. Ceiling of one of the bedrooms. The Golden Dragon weather vane. Reflecting on our visit to Newark Park during the drive home, Steph and I agreed that it had definitely been one of our best National Trust days out. Not only was the property itself interesting, and its location stunning, but from the moment we passed through the ticket office and shop, the catering pavilion (for a welcome cup of coffee), and around the house itself, all the NT staff and volunteers were exceptional in their friendliness. It was almost as if they were welcoming visitors into their own home. Well done, Newark Park staff and volunteers! We’ll be back in the Spring to see the display snowdrops and other flowering bulbs. This entry was posted in Out and about, Travel and tagged Cotswolds, National Trust, Newark Park.